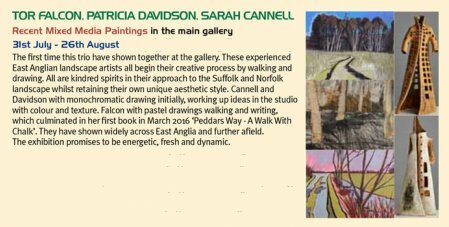 Recent paintings by three East Anglian landscape artists: Sarah Cannell, Patricia Davidson and Tor Falcon. All the artists approach their subject in a similar way by walking and drawing in the landscape, studying the light, composition, colour, texture. They then develop their works in the studio with a variety of media: acrylic, ink, pastel, graphite, watercolour and more. Each artist is very well established and has a unique, recognisable style, their works are in various private and public collections around the UK. This is the first time the three painters have shown together and the John Russell Gallery in Ipswich, Suffolk seemed like the perfect venue for the show. Anthony Coe’s beautiful gallery space is ideal for showing strong contemporary artwork and his attention to detail when curating means this should be a stunning exhibition.